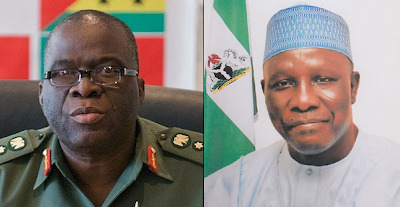 Kaduna State Governor, Patrick Yakowa and Retired General Andrew Owoye Azazi (former National Security Adviser to President Jonathan and Former Chief of Defence Staff) are Dead. They were confirmed to have died in a helicopter crash in Bayelsa State. It was reported that they boarded the ill-fated helicopter en-route to Port Harcourt, following their attendance of the burial of the Father of Senior Presidential Aide, Oronto Douglas in Bayelsa. Shortly afterwards, Nigeria's National Emergency Management Authority (NEMA) indicated that they had commenced search for a crashed helicopter. The helicopter was reported to have crashed by 3:30pm December 15,2012 around Nembe-Okoroba area in Bayelsa State citing no survivors. Naval Pilot, Lt. Adeyemi O. Sowole. This incident comes not too long after the plane crash on October 25,2012, which left Taraba State Governor Danbaba Suntai Brain Damaged.